Turn your bath into a relaxing whirlpool bath with this 6 jet DIY kit**. 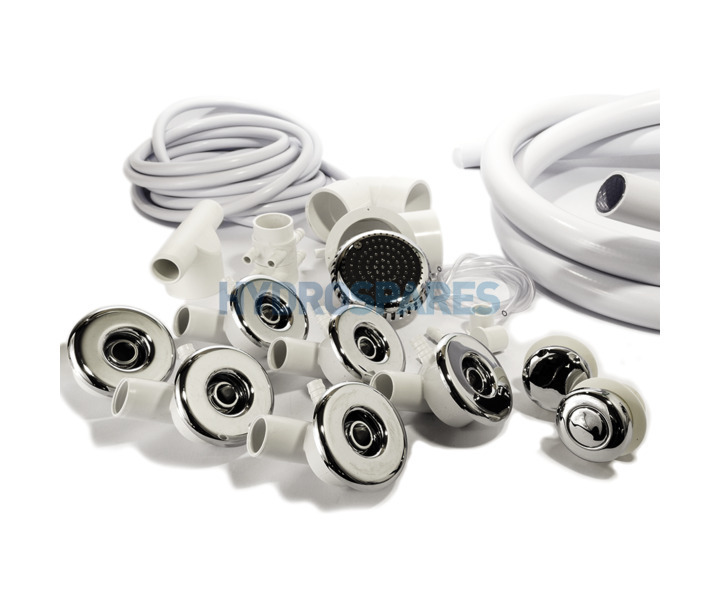 The SuperFlow 6 jet kit gives you 6 chrome fronted directional whirlpool jets with adjustable air inlets, plus controls plumbing and fittings. The included pipe work is enough to plumb and fit a 6 jet system to a standard bath. ** Pump and electrics required for safe function are not included. You will also need the correct length of pipe for the suction to pump connection, and the appropriate tools, solvents and some DIY knowledge to complete the job. No instructions are supplied with the kit (but there is a wealth of knowledge on the World Wide Web). We can offer advice on fitting over the phone.